On Sunday night, I attended the first evening of A BATTLE OF WILLS/Internal and External. It was three one-act plays, Tom Fontana's This is On Me, Harold Pinter's Ashes to Ashes, and Susan Charlotte's Love Divided By. The production is presented by Part Time Productions, a division of Cause Célèbre, in association with The New Group. Part of the proceeds from the ticket sales will go to Columbia Psychiatry's Lieber Schizophrenia Recovery Center. This is on Me is based on the works of Dorothy Parker. It was read by Marian Seldes, as Dorothy, and Delphi Harrington, as her friend. 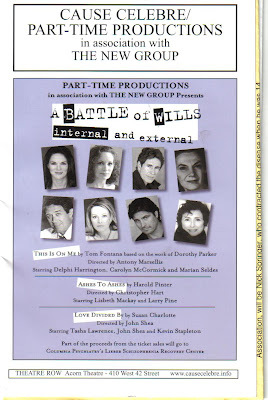 This was an abbreviated version of the one night only benefit that Angela Lansbury performed in 2006. It was fun hearing Marian's very dry wit applied to Dorothy's voice. Marian returned later in the evening to read The Waltz, by Dorothy Parker. The second one act play was Harold Pinter's Ashes to Ashes performed by Lizbeth MacKay and Larry Pine and directed by Christopher Hart. This was only my second Pinter play, and although I liked it much more than The Homecoming, it was still too dark and disturbing for me taste. It was only one act, but it felt like Pinter took forever to get to the point. Larry Pine and Lizbeth MacKay were off book and fully acted the roles beautifully. The final one act performed was Susan Charlotte's Love Divided By. This was another off book and fully performed piece. Tasha Lawrence played the sister, and John Shea wearing the dual hats of actor and director, played the brother. It was a frightening and violent look at his mental illness and his sister's understandable unwillingness to see him. There are three more opportunities to see these three one-act plays: June 7th at 3pm, June 14th at 3 & 7pm and June 21st at 7pm. It's running at the Acorn in Theatre Row on 42nd Street. The casts are rotating: notably, replacing Marian will be the equally wonderful Frances Sternhagen.